This service is used to access archived files from the legacy ELM shortcuts, if you have uninstalled Email Lifecycle Manager from your computer, and you need to check the archive contents. In this use case the ELM is installed on server taelm01. The retrieve service will be installed on the same server as it is recommended by us. 1. 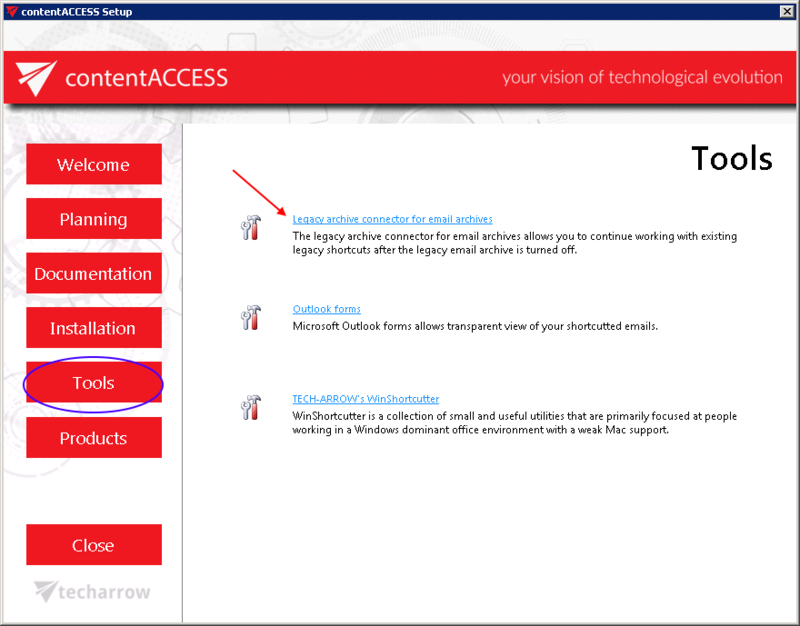 In the Tools of the contentACCESS setup package click on Legacy archive connector for email archives/Legacy archive connector for ELM and run the setup package. By default it unzips to C:\Program Files\TECH-ARROW\contentACCESS\LegacyELMRetrieve folder. Click “Unzip”. After the files have been successfully unzipped click “OK”. 6. The “Add Application Pool” window will open. Enter “LegacyELMPool” as name and select the .NET Framework version from the .NET Framework version dropdown list, then click OK.
7. Right click on the newly created “LegacyELMPool” in the grid, and select “Advanced Settings” from its context menu. b) Enter “MCSWS” into alias and “C:\Program files\TECH-ARROW\contentACCESS\LegacyELMRetrieve” as Physical path. Select the “LegacyELMPool” by clicking the “Select” button. a) Select the “MCSWS” node by clicking on it. c) In the “Edit Application” dialog, select the “LegacyELMPool” by clicking the “Select” button and enter “C:\Program Files\TECH-ARROW\contentACCESS\LegacyELMRetrieve” into the Physical path textbox. 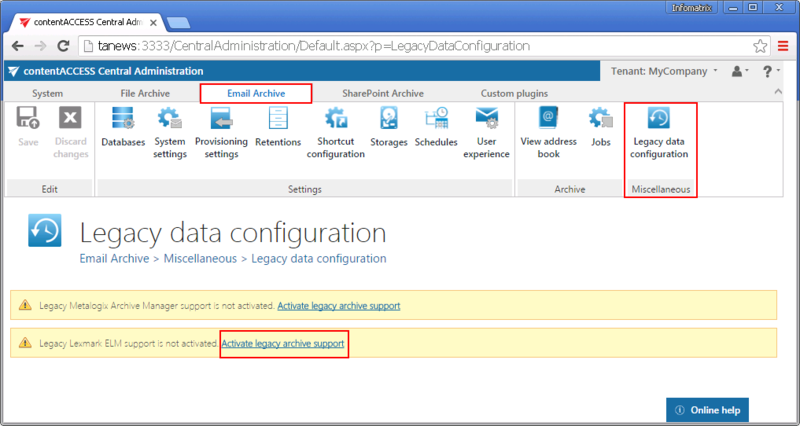 c) Activate legacy ELM archive support with clicking on the “Activate legacy archive support” option in the warnings box. d) Database settings: go to Email Archive ⇒ Settings ⇒ Databases button on the ribbon, and configure the connection with the old ELM database on the ELM server (in our case with taelm01). e) Go back to the Legacy data configuration page on the ribbon, and set the connection with the ELM database (ELMDB from step d) above) in the Database settings section. Need the ELM references, but it could be also referenced directly from the ELM machine. This is the path on which the Classic Connector jar files can be reached, e.g. “C:\Program Files\SAPERION\Application\scr\scr-classicconnector\lib”– to be configured in section CC library path. If Unified Base Interface (UBI) is used, this setting can be skipped. Also run a test connection to verify the connection with the Saperion server. http://[ELMServerName/MCSWS]/ and click on Configure. 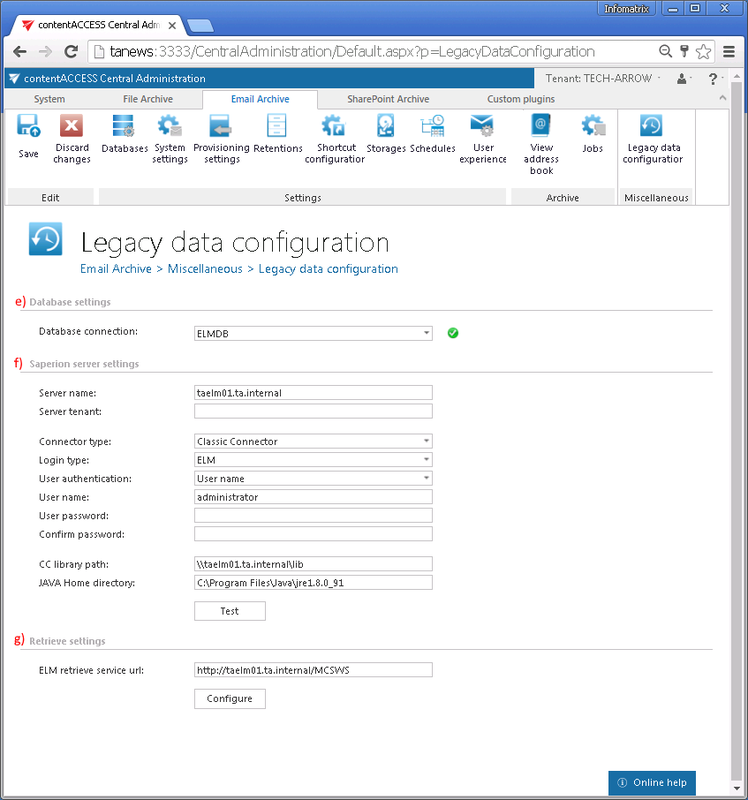 browse the legacy archive using contentWEB.